In the previous newsletter I gave a report on what has been happening within National Trust for Scotland (NTS) in terms of footpath management. NEMT has now given me the chance to update you on new developments for 2001. It has been a very busy period for NTS in pushing on with the projects we currently have running, and in developing future projects. George Mundell's team spent a large part of the summer in Coirie nan Lochan, working on the terribly eroded lower slopes opposite the Aonoch Dubh east face. Work focussed on pushing the path line back up onto the original path line, which had fallen in to disuse after a landslip on the upper side some years ago. A number of path lines were subsequently strewn across the lower slope, resulting in dreadful erosion on the steep till-laden hillside. The upper line presents a more sustainable line, in that once the initial 200 metre feed-in had been negotiated, much less intensive path techniques could be used on the more robust ground in order for it to cope with the heavy usage this part of Glencoe withstands. Further, the bulk of it has a lesser cross-slope than the lines lower down, improving the overall stability of the path-line. The work went very well overall, despite poor conditions in the early part of the season, and in fact the team completed both parts of the contract marginally earlier than had been allowed for. There were five obvious path lines already in use above the waterfall in Coire nam Beith, with four inside the Coire itself. All had erosion problems with varying degrees of damage according primarily to angle of slope, solidity of the ground and concentration of use. The team worked hard at a solution focussed on concentrating use onto a single path on the east side of the middle burn, before bifurcating towards the Stob Coire nam Beith and Stob Coire nan Lochan bealachs respectively. The eroded line between the right and middle burns in particular had to be re-routed, as the only solutions to providing a footpath on this section would have required such intensive construction that the works themselves would have had an impact on the landscape. This was a difficult job carried out during the back-end of the season by Wildbuild. They used the Remote Accommodation System, with the units tucked away in the coire as unobtrusively as possible. As soon as the site work was finished the units were dismantled and removed. The new line was constructed along the edge of the burn, removing it from the open slope where only the most intensive path repair techniques could have been used. By re-aligning we were able to use 'stalker' style techniques using aggregate instead of stone pitching, and toning down the works as much as was possible. This year will see our efforts renewed on Coirie Etchachan. We will be addressing the most serious erosion concern in the coire, the large 'hole' part way up the approach to Loch Etchachan. When working on this type of path sensitivity to the environment is the overriding concern. It is our intention to use experimental re-vegetation techniques, as tested on Beinn a Bhuird, using plants sourced from the 'damage zone' only. The path will be built using all we have to hold a sustainable line together with informal construction techniques, and with the onus much more on erosion control than on path building. Upland Access Ltd will again be carrying the work out on this path, and Angus Turner and his crew will be utilising the Remote Accommodation System once again. All of the path work mentioned above is geared towards erosion control on our mountain paths. When re-alignment is mentioned we do not of course mean that there is any formal attempt to control or restrict access to any part of the hill. Rather we hope that the route will lead you away from the recovering ground without you feeling in any way inconvenienced. However, for the ground to recover we rely on hill-users to be aware and supportive of what we are trying to achieve, and to try to stay off of the recovering ground as much as you can. This is the final year of the project, and by December the track will be removed all the way to the tree line, leaving only a narrow and unobtrusive footpath in its place. Full recovery of the ground will take many years, particularly on the wind-blasted shoulder approaching the south top. We have used vegetation transplants within the 'damage zone', and attempted to recreate a micro-topography conducive to survival of the montane plants, and eventually to allow full natural regeneration of the entire track area. Kate Proctor, the Trust's ecologist at Mar Lodge Estate, has endured many a bitterly cold day collecting data in studying transplant survival and re-generation high up on the hill during the late autumn. She is producing a highly valuable data-set which will certainly have application within the path industry for re-vegetation at altitude without using imported seed or fertilizers. Once complete, in the region of 4.5km of vehicle track will have been restored to 'natural' landscape. However if we think of distance from the nearest road as being indicative of a wild land experience, or 'getting away from it all', in the act of removing a highly visible vehicle track we should have enhanced the wild landscape value within view of this side of the hill. NTS has wrestled with the issue of using heavy machinery high up in the hills, and we have come to the conclusion that this project is exceptional. The earth movement involved would not have been viable in practical terms by hand, and by using excavators at altitude in the short term, we are increasing wild land value in the long term by removing the vehicle tracks entirely. In the last edition of 'Mountain Views' I mentioned that NTS had placed two separate applications for funding from the European Social Fund with a view to securing this project for at least another 2 years. This application was indeed couched in a great deal of acronyms, as seems to be difficult to avoid with anything related to training and development or European funding. Suffice to say our applications were both successful and for the first time we will be able to offer places on the course on both sides of the Cairngorms. I would also like to take the opportunity to acknowledge our funding partners for their continued support, including all of the Local Enterprise Companies involved as well as Scottish Natural Heritage. The most recent 6 month course has just completed, with trainees carrying out work on a variety of sites including Torridon, Kintail, North Cairngorms and some lowland work for Moray Access Strategy. The now ex-trainees will likely go on to work for path contractors who work throughout Scotland, and I hope to meet at least some of them on future visits to work sites. We will also be offering short courses in path survey, design and management as part of the project. As we have reviewed the lessons learnt from past experience, and anticipate the challenges that lie next it has caused us to pause and take a (very deep) breath. There are a number of issues that have become apparent when planning future projects. The 'method' of working high up in the hills, in the most fragile landscapes, requires a change in emphasis. As we find ourselves confronting the erosion problems high up and far in to the mountains, it is essential that we do the right thing by the mountains. All of our work should be sensitive to the environment at all altitudes, but especially so on the high ground. On some of the highest sites we realise we must take a low input approach over the long term. On the highest and most sensitive sites pre-emptive works have to be the way ahead, rather than intensively working the ground over a short period. We need to be able to send a small crew of highly skilled workers back year after year, to respond to emerging problems, and to develop new and more sensitive techniques on the higher ground. It is clear that this problem will not go away, and it requires a revenue-based approach to funding not just for the next few years, but as an ongoing process. We will still utilise capital funds where we can raise them to carry out intensive projects where appropriate, and there are many sites that require this approach throughout Scotland. The work at Coire Odhair is a good example of this, as was the work at Coirie nan Lochan. The job needed completed from start to finish before the re-alignment took effect and the damaged ground began to recover. The long term, and 'light touch' approach that is required in the most sensitive areas of our mountains cannot be raised entirely through development grants. 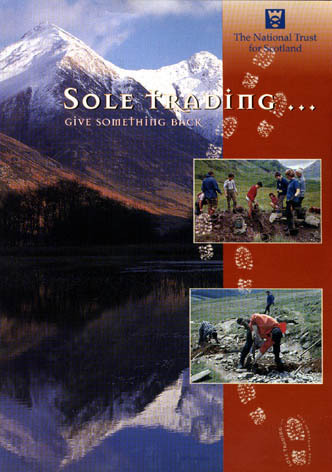 Through 'Sole Trading' we have appealed to our members and now we appeal to all those who care for the hills to contribute to the long-term approach to this work. Through the Appeal, we can utilise Give As You Earn, which means that you can sign up to donate a sum of money directly from your pay, and prior to taxation. A donation of �5 per month will raise �60 per year. If a thousand people signed up for this, it would raise enough to run a team of three skilled workers per year. Twice that would mean two teams and so on. We intend to run this Sole Trading Appeal as a 'pilot' scheme, which could show a way of addressing path erosion on all of Scotland's mountains. For more information on the appeal contact either Lorna Stoddart on 0131 243 9341, or myself, Dougie Baird on 01463 732586.